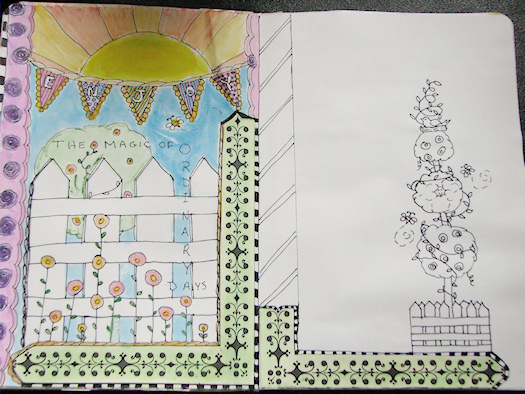 Yes, I am still doing the art journaling classes with Jenny and Aaron of Everyday is a Holiday… very slowly. Week Three took me longer than I thought it would. It developed very slowly. There were days that I stared at the pages, did nothing and put the journal away. There was other art to finish. Digital art. 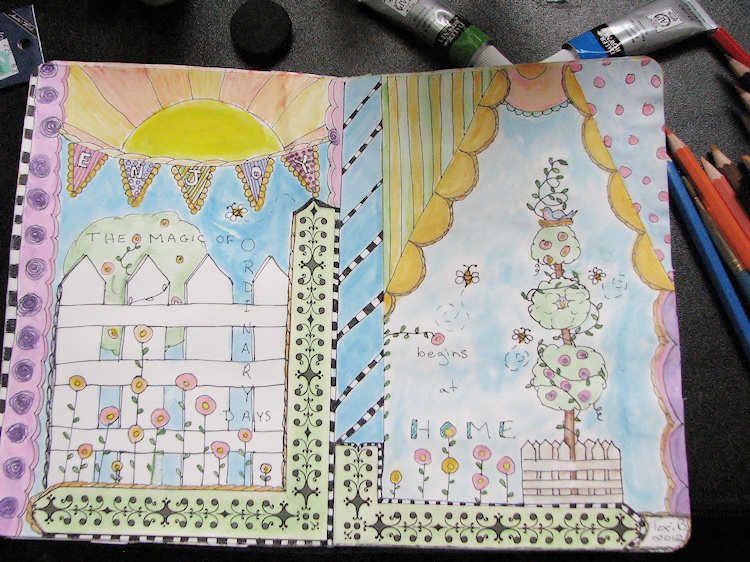 I couldn’t concentrate on the journaling until the other was finished. What I ended up doing for Class Three was not at all even close to what Jenny and Aaron had suggested and demonstrated in their wonderful pages. I did read the lesson and watch the video, a couple of times. I didn’t follow even a quarter of what they demonstrated. I ended up doodling. Thank goodness that Jenny and Aaron stated that art journaling is meant to be a free art form, or I’d feel guilty. I don’t have a photo of the start of the left page. For some reason, photographing this was very far from my mind. 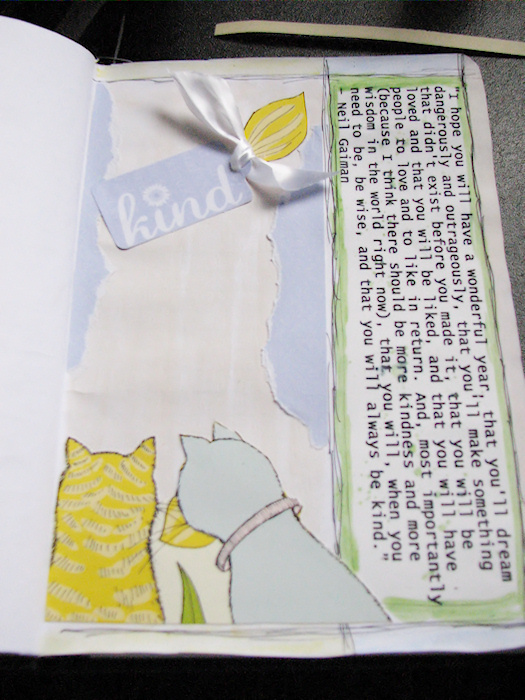 The green washed border was cut from Anna Griffin paper, everything else was drawn with my sharpie pen. The banner actually became my free Crudoodle digital stamp last week. You can find it HERE in a blank version and the e n j o y version. 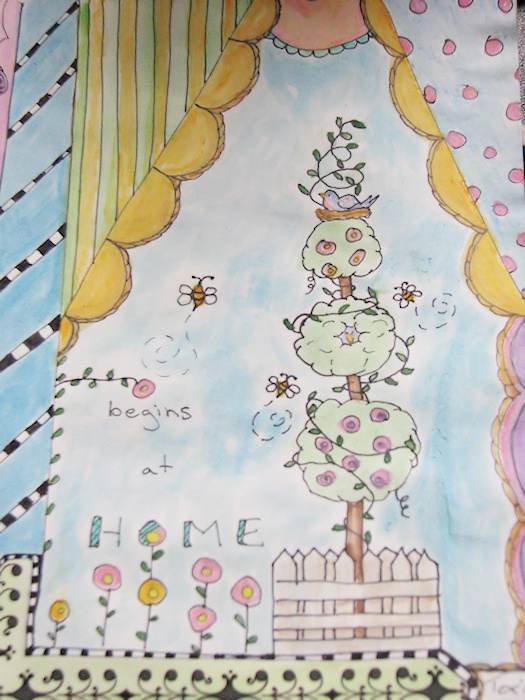 I added color with watercolors and watercolor pencils and more doodles with my trusty sharpie. The finished pages. Please click on the image to view it larger. 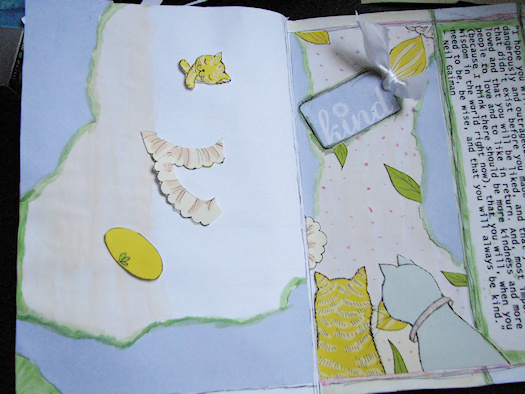 Week Four’s class encouraged us to make the pages our own. Week Three had put me well on my way to doing that and I was eager to continue. I chose to center my pages around a quote by Neil Gaiman. I started by printing out the quote, finding a few paper elements to go with it and chicken scratching with my sharpie. Again, Anna Griffin papers. I had thought originally to use pink paper, but ended up beginning with these colors. I am not normally drawn to yellow, but find myself drawn to it more lately.. anyone have a clue as to what that means? I wanted to keep it soft and pastel. 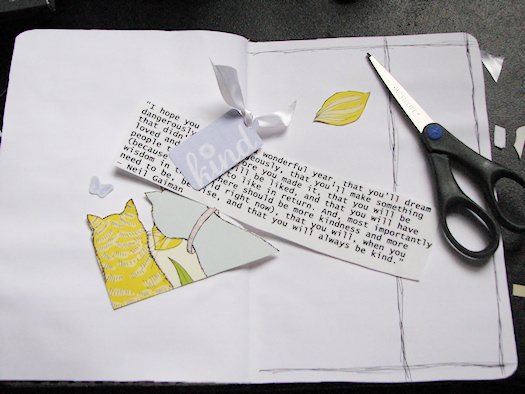 I decided that the quote would go on the right page and started laying things out. A little paint was washed over the large blank area and the borders. As the right took shape, I moved to left page. I added splatter, dots, rings and used stickers to spell out ‘always be kind’. The finished pages… again, please click on the image to see a larger version. I hope you enjoyed seeing my journals. 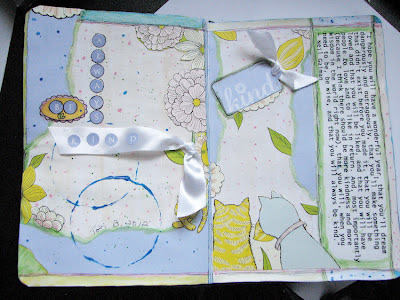 You can see other journals and the lessons over at Jenny and Aaron’s blog, Everyday is a Holiday. Just click the link below. 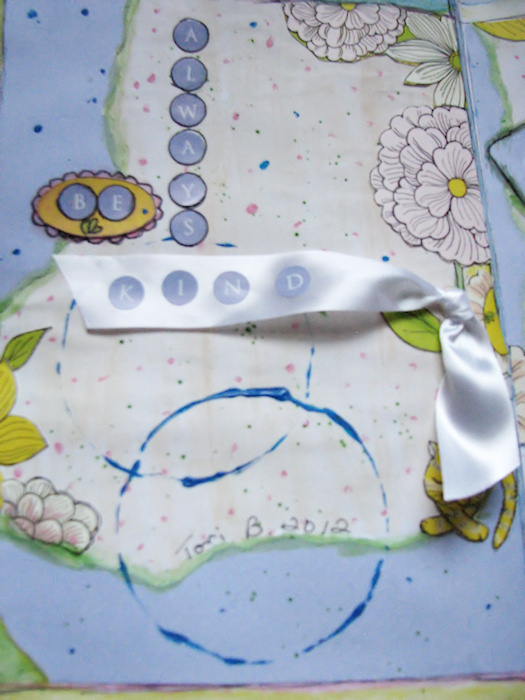 Posted in Uncategorized and tagged altered art, art journal, doodle, journaling. What great pages! And what stands out the most is just how YOU they are. Your style always shines through in your work. You've got such a distinct hand. The soft colors of Always Be Kind are so sweet. Thanks so much again for playing along with us…thrilled to have you! Thanks Jenny and Aaron. 🙂 I'm playing catch up again on the latest two pages. Expect to see them soon. Thank you so much Kristin. I hope you do some more and post a few too. I'd love to see them.